The millrace has a rich and significant history spanning more than 165 years. Interest in revitalizing the millrace has had an almost equally long history. This interest is surging again in part due to plans to site the Knight Campus for Accelerating Scientific Impact along its banks. This webpage is a repository for the accumulated wealth of millrace information and provides a launching point for future faculty and student projects. University of Oregon faculty, staff, students, and community members have conducted numerous projects involving the millrace. These have resulted in engineering studies, maps, historic photos, environmental impact assessments, wildlife studies, stormwater maps, and even a feature film! Campus Planning and Facilities Management looks forward to working with faculty and students to preserve the millrace’s past and shape its future. Please contact Steve Mital, UO Sustainability Director, with ideas. In the 1850s, settlers built Eugene’s millrace by digging a ditch five blocks to connect two existing natural sloughs. The water flowing through the millrace powered saw mills and flour mills and fostered an environment for additional economic growth. The railroad arrived in 1871 and supported another building boom. By the early 1900s, people began building homes along the millrace. This, combined with occasional damage from floods and the arrival of electricity, led to the decline of the millrace’s value to industry. Recreational uses became the dominant activity and University of Oregon students swam and boated up and down the Millrace. An annual water parade was established. The Anchorage opened in 1915 and was a popular gathering spot for the next 35 years. Recreational use of the Millrace largely ceased by the 1980s. 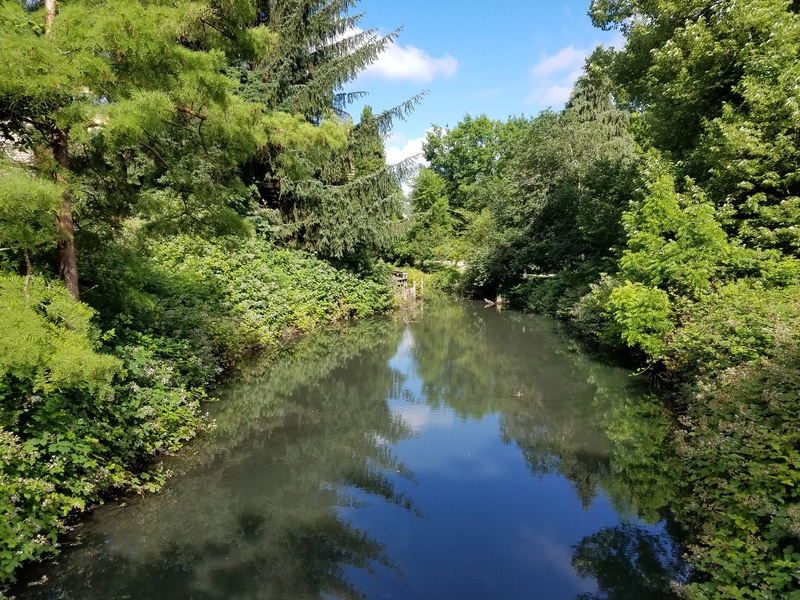 However, various efforts to restore it for habitat, recreation, and historical connection continue and demonstrate an enduring interest to revitalize the millrace.